Dratini, and its final evolution Dragonite, are well-loved by the Pokémon community. In mainline Pokémon games, Dragonite is considered a “pseudo-Legendary,” a selection of only eight Pokémon whose base stats equal 600 at maximum level. This stat value is extremely high, even higher than that of some Legendary Pokémon, making these Pokémon very powerful and valuable choices for any Pokémon team. 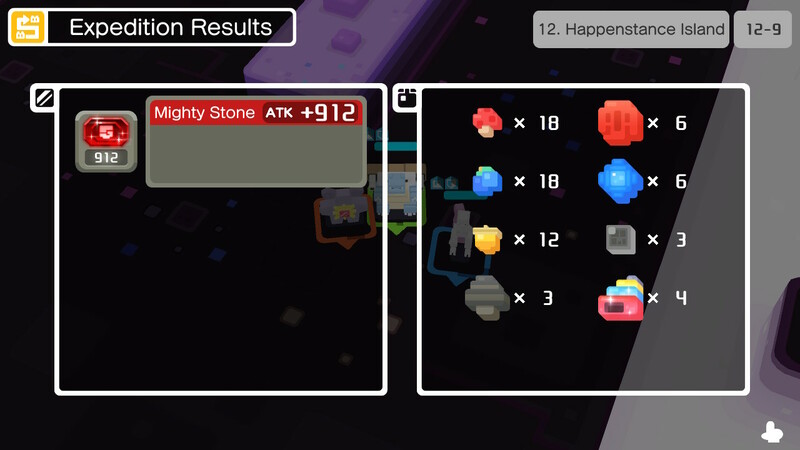 Dragonite in Pokémon Quest is no exception, as it still features significantly high stats. It’s worth noting that, unlike in mainline Pokémon games, it is generally more desirable to “catch” a Pokémon at a higher base level. The higher a Pokémon’s level when it arrives at your camp, the higher its overall base stats will be at max level. You can attract higher level Pokémon to your camp by using a higher tier Cooking Pot. This is extremely helpful with Dratini, due to its high level requirements for evolution to Dragonair (30) and eventually Dragonite (55). You can learn more about cooking in Pokémon Quest with our in-depth guide. There are two recipes that can attract Dratini to your camp: Blue Soda à la Cube and Mulligan Stew à la Cube. If crafting Blue Soda (which you should), the recipe’s quality must be at least Good, meaning you need to use at least one Precious ingredient. To ensure the best possible chance at attracting Dratini, you’ll want to cook these recipes at Special quality. Special quality requires at least four Precious ingredients, so you’ll need to use Icy Rock. You can use any Precious ingredient for the last slot, including Rainbow Matter. It’s also technically possible to attract Dratini using the Mulligan Stew à la Cube recipe, which attracts a selection of Tumblecube Island’s Pokémon. 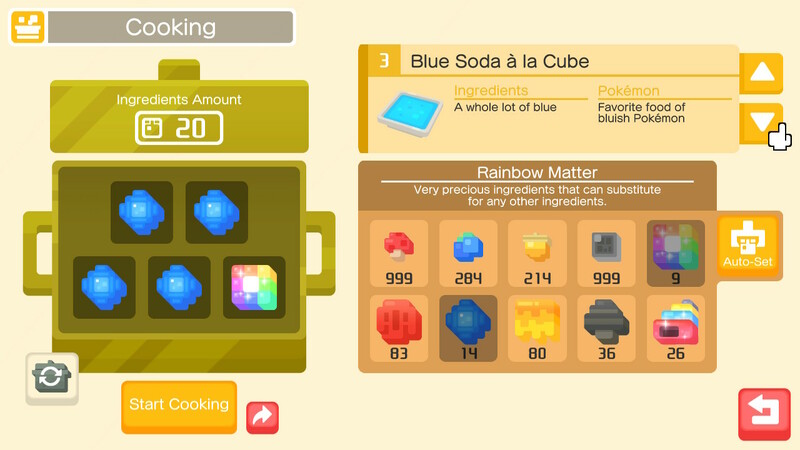 However, it’s worth noting that this recipe attracts from a much larger pool of potential Pokémon, having a chance to attract at least one of 30 different Pokémon, versus only 7 possibilities attracted using Blue Soda à la Cube. Dratini can also be attracted using the Very Good or Special qualities Mulligan Stew, though the chance is much lower if using the Very Good version. Strangely, you actually have a higher chance using Very Good Mulligan Stew than you do using Very Good Blue Soda. Go figure. Icy Rocks are extremely valuable, as it’s the Precious quality ingredient required in crafting Blue Soda à la Cube. 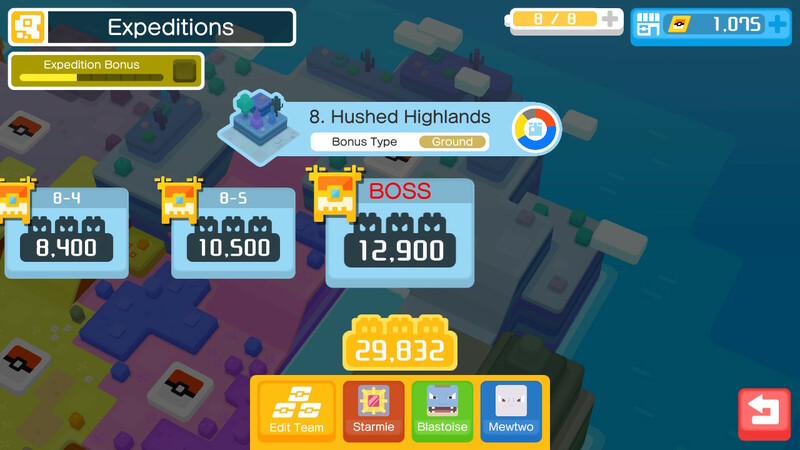 The best place to farm Icy Rock is World 8: Hushed Highlands. This world has the highest drop rate of Blue ingredients, which you can check using the color wheel located next to the world’s recommended power level. If you haven’t yet made it this far, you can also obtain Blue ingredients in World 3: Backforth Brook, though here you’ll receive significantly more Small ingredients than Precious quality. Simply farm the highest level in either World that you can regularly, successfully complete. It’s worth noting that World 12: Happenstance Island, offers an equal drop chance of every color ingredient. Here you can also obtain Mystical Shell required for attracting Legendary and Mythical Pokémon, so it may be beneficial to just farm these worlds for more diverse drops. Vaporeon Cusheon: Size of blue ingredient drops x 1.5. Costs 50 PM Tickets. Blastoise Fountain: Size of blue ingredient drops x 2. Costs 300 PM Tickets. Be sure to check out our handy guide to all of the available decorations in Pokémon Quest. Dragonite’s most powerful ability, and undoubtedly one of the most powerful moves in Pokémon Quest, is Draco Meteor. 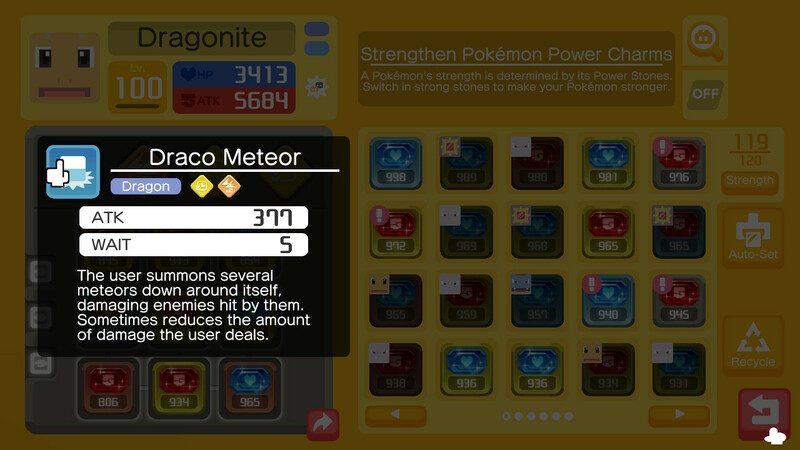 Draco Meteor launches several meteors around Dragonite, which is awesome for taking out large packs. It can be quite difficult to learn Draco Meteor, as it’s only available once your Dragonair has evolved to Dragonite. Dragonite has a large pool of possible abilities, so it may take quite a bit of Move Learning before you shuffle through the ten possibilities and get lucky to land on Draco Meteor. Or you could get lucky and get it on your first try. Isn’t randomness fun? Get more information on how to learn and change moves in our guide. To ensure you have valuable fodder to use for Move Learning, we’d recommend attracting Dratini until you get one with valuable Bingo Bonuses and a single move, which allows for use of three Move Stones. You can then use all of your extra Dratini as fuel for Move Learning, once your all-star has evolved to Dragonite, to hopefully learn Draco Meteor. Good luck!